The military’s research division just put out a call for project ideas. By 2020, the Russian military claims it will have nuclear missiles capable of gliding across the upper atmosphere — too low for most satellite detection systems — before plummeting back to Earth at 20 times the speed of sound. This puts the rest of the world in a pickle because there’s no good way to stop these hypersonic weapons. 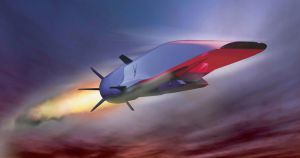 So last week, according to The National Interest, DARPA put out a call for proposals for Project Glide Breaker — an initiative it hopes will result in an interceptor capable of stopping hypersonic missiles and vehicles. These plans to build an interceptor capable of stopping a hypersonic weapon seem far-fetched. As Kelsey Atherton wrote for Task & Purpose, there has yet to be a single missile defense system that succeeded without being seriously rigged. That aligns with The National Interest’s reporting, which suggests that it would cost far too much to effectively shield the U.S. in this way. Rather, the best bet for Project Glide Breaker would be just effective enough to deter attacks by blocking just enough missiles that an adversary wouldn’t be able to reliably count on any one given missile reaching its target. All of this is to prepare for an all-out war, nuclear or otherwise, that hasn’t happened yet. While it’d be nice to have a shield in the event that such a conflict arose, there’s a world of difference between a country maybe someday building a weapon against which it is difficult to defend and ever expecting that weapon to be used. Right now, we’re far away from the latter. Russia Wants to Vaporize Space Junk With a Laser. There Is No Way This Will Go Wrong.